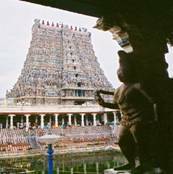 The city of Madurai was planned and laid out on the pattern of a lotus flower, with the famous Meenakshi Temple in the centre. The foundation of this temple and the town is attributed to the Pandian King Kulasekhara. Legend goes that a drop of nectar from Lord Shiva's locks fell here. So the city came to be named as Madurai, the city of Nectar.Madurai is very well connected with Chennai by air, rail and road routes. The city of Madurai is situated on the banks of the river Vaigai and is bordered by three hills, known as Yanaimalai, Nagamalai and Pasumalai.It is located between 9.93º North Longitude and 78.12º East Latitude. History dates back to say that Madurai is more than 2000 years old and it is one of the ancient and oldest city of India.Madurai is known for its cultural heritage.Madurai which houses the Tamil Sangam is the place where the first Tamil epic of India, Silappathikaaram was produced. The city is known for various other master pieces of Tamil literature. This famous pilgrimage centre was the capital of the Pandava dynasty. This sacred city is mentioned in almost all the holy scriptures of Hindus. This is a very popular festival in the city of Madurai which is celebrated during the months of April and May. 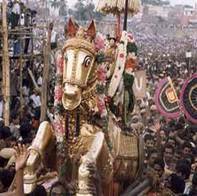 The legend behind this festival is that the marriage of goddess Meenakshi and Lord Sundareeswarar in the Tamil Month of Chithirai was attended by Lord Vishnu as Alagar who came on a golden horse to Madurai.This festival witnesses a major grand crowd of people. Float Festival - Temple tank is a unique presence in the temples of Tamilnadu.During the float festival the deities will move around the tank on a decorated float. The other common festivals celebrated here includes Diwali, Pongal, Avanimoolam festival and Navarathri festival. A superb example of Dravidian architecture and sculpture, it is the focal point around which the city has developed. The temple has two sanctums, one dedicated to Lord Shiva as Sundareshwarar and the other to his consort Meenakshi.This is one of the largest temples in the country. Of the many sculpture in the temple the most striking is that of the divine marriage of goddess Meenakshi with Sundareshwara.The highlight of this temple is the hall of thousand pillars which has a number of remarkable sculptures. This temple belongs to the 8th century and it was built by the Pandaya rulers. This temple is situated on a small granite hillock in a place called Thirupparankundram which is 7kms away from Madurai.This is one of the six sacred abodes of Lord Murugan and this is where he got married to Devyani, daughter of Indra. The deity worshipped here in the Kudal Alagar Temple is Lord Vishnu. The walls of this temple are excellently sculptured and are known for its stone carvings. The temple is considered to be one of the 108 sacred Vaishnavite shrines in India. This temple is named after the deity here, Kallalagar, an avathar of Lord Vishnu. It is located 12kms from Madurai at the foot of the Alagar Hills. This one of the popular cathedral for the Christians known for its Neo-Gothic architecture. This magnificent church was built during the reign of British. It is concentrated on the western side of Madurai. This is one of the oldest place of worship for the muslims in Madurai which was built by Hazrat Kazi Syed Tajuddin who visited the city from Oman.Maqbara the dargah of famous Madurai Hazrats is also located inside the mosque campus. This masjid is situated very much in the middle of the town. This museum shares its place in the Tamukkam Palace which belonged to Rani Mangammal dating back to 1670 A.D.The foundation for this museum was laid by Gandhi Smarak Nidhi and it has a number of articles closely associated with the life and works of Mahatma Gandhi in its store. There is a picture gallery, which includes quotations, photographs, paintings and some Photostat copies of Gandhiji's letters. The Palace is constructed in the Indo Saracenic style, is considered to be architectural feast.Bult in the 17th century, the palace has a number of pillars, their heights varying from 4m to 12m and 15 domes of which three are very huge. The sound and light show organized by the department of tourism in the palace depicts the story of silappathikaram and the life of Thirumalai Naick. The Vaigai Dam is one of the famous picnic spots which is situated at a distance of about 70kms from Madurai in Theni district. Near the dam the Government of Tamil Nadu has constructed the Agricultural Research Station for researching the growing of a variety of crops, including paddy, sorghum, blackgram, cowpea and cotton. This is a huge temple tank measuring 304.8m on each side with a mandapam at its centre. During the float festival pilgrims gather in large numbers and the temple deities are taken out in the tank on the decorated barges. 3.Khadi Gramodyog Bhandar - West Veli Street. 4.Co-optex - Opposite west tower and south tower street. 6.Surabhi,Kerala Handicrafts Emporium - West Veli Street. Madurai is connected by Airlines flights to Chennai, Cochin and Bangalore. Madurai is connected by train directly to Chennai, Rameshwaram,Tirunelveli,Quilon,Trichy,Bangalore and Tirupathi. Madurai is connected by good motorable roads to all the important places in South India.